When you shop online for clothes it can be so easy to see six hours whizz by without even having bought as much as an accessory. The internet is a vast place with lots of inspiration, amazing online shops and money to be saved – but it can also be beyond distracting at times, which can lead to our online clothes shopping sessions being scuppered very quickly. You still have something to work from, compared to nothing. One of the key things we can enjoy when online shopping, is looking through tons and tons of inspiration that help us get the perfect outfit. The problem is, there is so much inspiration it can be overwhelming and we can enjoy so many pictures before we actually get down to the shopping bit. Browse inspiration sites like Instagram, Pinterest and articles and videos from your favourite bloggers before you get down to shopping, maybe when you’re travelling to work or having some downtime. This will cut your shopping time down considerably because you will have a much clearer idea of what you do and don’t want. Before you start shopping, choose which sites you will be going on and stick to those sites. Pick your favourite high street shops and online fashion retail shop and don’t drift browsing anywhere else. This is useful when you know which brands suit you the best. Choose the time you will be shopping until, so that you push yourself to complete the ‘task’ for that time. There are apps online that enable you to only go on specified sites for a certain amount of time, ensuring you stay focused. So if you’re serious about buying this outfit and getting this job done, use a focus app and block distraction sites like social media. Get a cup of tea and some snacks with you when you are shopping so you’re not going to and from the computer. If you try to go online and shop when the kids are back from school, your husband is getting ready to go out and the dog is on a ‘mad one’ then you will struggle to relax and enjoy your online shopping experience. 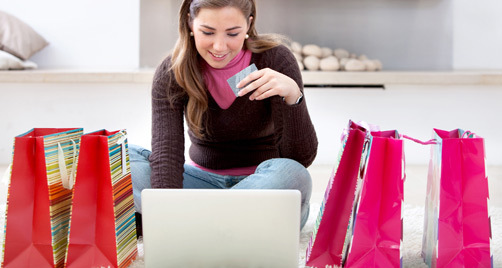 Sit down to shop online when it is quiet and you can completely relax – it shouldn’t be stressful. 1. There will be distractions and you may well have a screaming child sat next to you, a couple having a full on argument and a group of ladies having a lot of fun and laughter right behind you – not really the best setting for online shopping. 2. You will not be on a secure network – there are massive security issues with shopping online using a shared internet network. Remember, online shopping for clothes should always be fun! Just be sure to set yourself up for success before you get started.